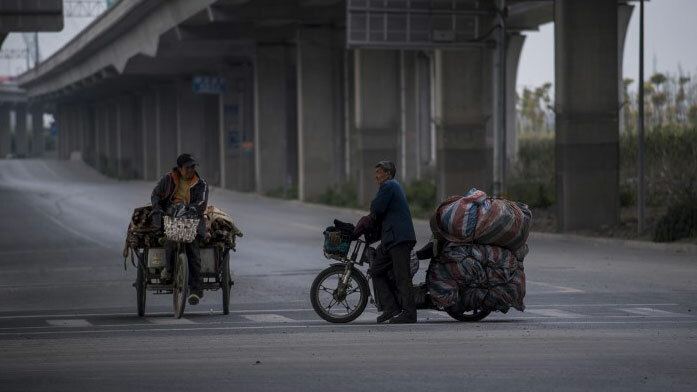 Two migrant workers with their tricycles under an elevated road in the suburbs of Shanghai, April 5, 2017. China's migrant population, drawn to cities and pushed out of poorer areas by by mass layoffs and rural land grabs since the 1990s, has risen in recent years to more than 200 million, nearly one-fifth of the population. Nonetheless, they continue to head in all directions. Migrants from other regions of China have also been flooding into Tibet and Xinjiang, as part of what critics say is a deliberate policy to suppress the local ethnic minority populations. Xinjiang's population saw a 30 percent rise since 2000, while Tibet's increased by 28 percent. But Liu Kaiming, who directs the Institute of Contemporary Observation in the southern city of Shenzhen, said recent changes in the hukou regulations have made it harder to get established in "first-tier" cities like Beijing and Shanghai. "Although there have been reforms to the hukou system in China's small and medium-sized cities, the threshold for migrant populations to transfer their hukou to first-tier cities like Beijing, Shanghai and Guangzhou, is very high," Liu said. "China's floating population mostly consists of farmers and small-town residents, who head for the coastal cities and first-tier cities," he said. "But the hukou system means that the way they are treated and the social services they can access are tied to their place of birth," he said. "So, even if they move to a new place of work, they still can't enjoy the same benefits that local people do." Beijing University of Science and Technology professor Hu Xingdou said that the stratification of privilege is becoming very marked, with first-tier cities attracting far more wealth and offering more resources. "Beijing is a privileged city, and its medical, educational and other services are of a particularly high standard, because many people living in the city are privileged," he said. "The government allocates a certain amount of resources to the city." Hu called for an end to the hukou system altogether, to narrow the wealth gap between the richest and poorest places in China. "This way, city people would be allowed to buy real estate in rural areas, to invest there," he said. "It would also be possible to settle in rural areas, which would promote their development." "This would also in turn ease the problem of very high prices in big cities," Hu said. "Narrowing the gap between the cities and countryside would also mean that rural residents have more opportunities in their hometowns." The majority of migrants hail from the central provinces of Henan, Anhui and Hunan, while their top destinations are the rich coastal provinces of Guangdong, Zhejiang and Jiangsu, according to a map published by the search engine and online encyclopedia Baidu. Reported by Gao Shan for RFA's Mandarin Service. Translated and edited by Luisetta Mudie.